According to Samsung and Apple, all 2018 and 2019 4 Series, 5 Series, 6 Series, 7 Series, 8 Series, and QLED Series TVs will work with AirPlay 2, and presumably, those television sets will also get the iTunes app. Other smart TVs with AirPlay 2 support will also work with HomeKit, but Samsung's televisions will not feature HomeKit integration and will not be listed in the Home app. Many of the other 2019 television sets are not available for purchase on Samsung's site but should soon be showing up on websites for various retailers like Best Buy, B&H Photo, Amazon, and others. QLED: just LCD with local dimming, but it sounds cool and confuses uninformed consumers who think they’re getting a great deal on an OLED. I think it's so misleading that Samsung uses the term QLED; the uninformed public is lead to believe this may somehow be similar to OLED … which is it not! I'm not saying the name isn't potentially confusing (and potentially misleading), but QLED isn't LCD with local dimming. The "Q" stands for "quantum", as in quantum dots that increase color volume, brightness, and viewing angle. It has nothing to do with local dimming. In fact, the entire 2017 QLED series, and the 2018 Q6 do not have local dimming. (That said, if someone can't tell the different between a Q and an O, or don't bother research the technology differences before they spend two grand or more on a TV, they get none of my sympathy). There is no reason for anyone to need an 8K TV at 65" if you're using it as an actual TV. With 20/20 vision you don't even get the full benefit of 4K at 65" in a typical living room. For instance, at 6ft away from the TV, you would need a 100" TV to start to see a difference over 4K. There are actual calculators and charts online that will tell you this. And that's just to start—it's not even anywhere close the full benefit of 8K at that huge size and close distance. Perhaps it could be used as a computer monitor, but that just sounds nuts and possibly painful to look at a screen that big that close all day, having to move your head all around. I hope consumers aren't going to fall for this 8K BS. Samsung is a such a joke company. Hmm...what could that look like? 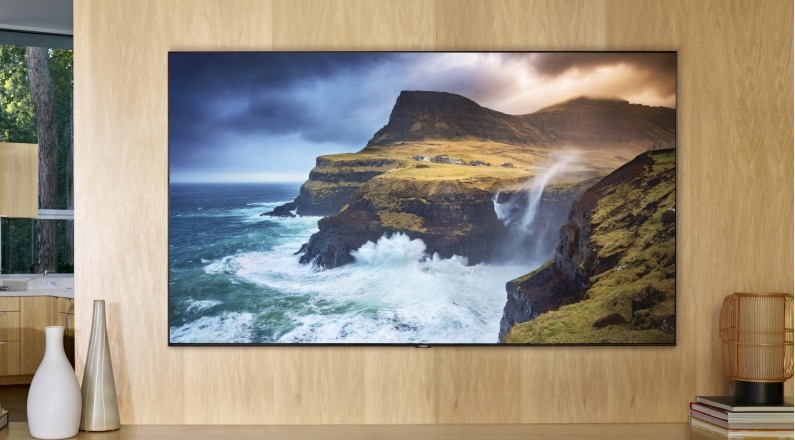 At $5000 for a 65 inch set--that's more expensive than an OLED set of the same size. What's the advantage, if any, over OLED? Brightness is the primary advantage, including peak HDR brightness. If you're watching TV in a bright room with lots of windows, that might be an advantage. Also, some people are concerned about OLED burn-in; LCD is immune from burn-in. Judging by your tagline of gadgets, you more than anyone should understand that need has nothing to do with a decision to buy an 8K TV or a 4K TV for that matter. It's called conspicuous consumption. It's what we do. What you did mentioning that chart? I sincerely doubt anyone has ever purchased a TV with that type of info as a guide. It's nearly useless beyond being a conversation piece. About as useless as someone telling you that an iPhone 8 is just as good as an XS or an XBox One is just as good as an XBox One X. That's not how people buy. So your assessment is right in a technical sense. It's completely wrong in a practical sense because it ignores the human element. We buy excess because of want, not need.